Everyone, lets officially welcome Matthew McConaughey and Jared Leto to the 2014 Oscar race. "Dallas Buyers Club" premiered late on Saturday night at the Toronto International Film Festival (the flick didn't start until after 10 p.m.), but the spectacular performances kept the audience wide awake. Following the movie, stars McConaughey, Leto, Jennifer Garner, and director Jean-Marc Vallee walked out for a Q&A and happily received a standing ovation from guests. You might know the film as the movie Matthew got really, really skinny for. The "Magic Mike" actor noted there was one person who didn't enjoy his 38 lbs weight loss. "I actually had a lot of energy at that weight," he told the audience at the Q&A, which started after midnight. "My wife wasn't too fond of it. It's what was needed to be true to the role." Maybe Camila got annoyed because McConaughey was sitting on the couch (we kid). He told The Wrap he lost the weight by staying home for weeks and carefully monitoring what he ate. However, the actor added losing the weight "was the easy decision." "I would have been embarrassed standing here looking like I do now playing the guy," he told the crowd. "They didn't bother with craft service," quipped Garner. "Just me and the crew sneaked doughnuts off to the side." The $4 million film was shot in about 27 days. "If people could only see how this tiny crew scrambled around, and how we never stopped shooting — I remember those days, because I was eating," the charming Garner reminisced. "I remember very well the days that were hard." 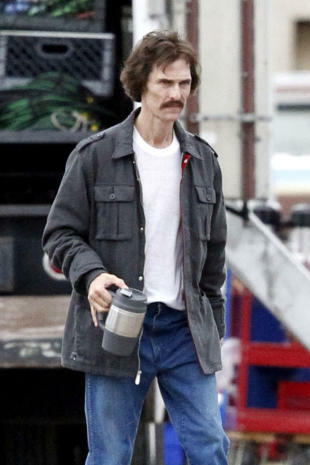 Matthew McConaughey will certainly silence his critics with his performance in "Dallas Buyers Club." However, for co-star Jared Leto, he needed no convincing to sign onto the film. 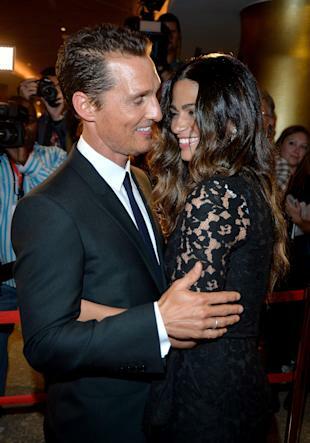 "I have to say, Matthew McConaughey is doing something spectacular with his life. With his career. And I wanted to be a part of that," the Thirty Seconds to Mars musician told the audience about why he came back to the cinema world (his film roles have been scarce over the past few years). "He's doing the most incredibly inspiring work. That was a huge part of my decision." Following the screening, the "Dallas Buyers Club" cast and crew celebrated by throwing an afterparty at Cibo. Matthew and Jared were the men of the hour. Holding court at tables near the entrance, people were lining up to offer their congratulations to the stars. Both actors were beaming as they smiled and laughed along with partygoers. One sign Matthew was having a real good time: he stayed at the bash until after 2 a.m.! Hey — we would be feeling just as good if we were Matthew right now.